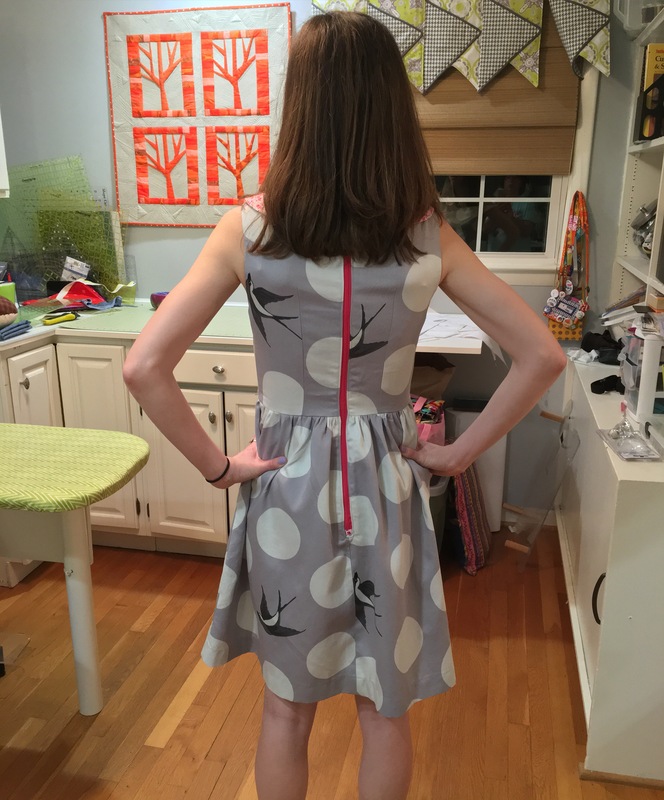 I knew when I spotted the Emery Dress (pattern by Christine Haynes) on Indie Sew that I had to make it. This would be my first attempt at a fitted dress but I loved the silhouette and classic/vintage style. I really wanted to make it using my Tula Pink Free Fall fabric I bought back in the Fall. I thought my small pink floral print by Liberty of London (that I have been hoarding) would be perfect for the collar and bow accents. I decided to go with the PDF pattern that you print at home and tape together. I had no idea I would be taping an 8ft long sheet of paper together. I haven’t decided whether I will be using a PDF pattern again in the future. 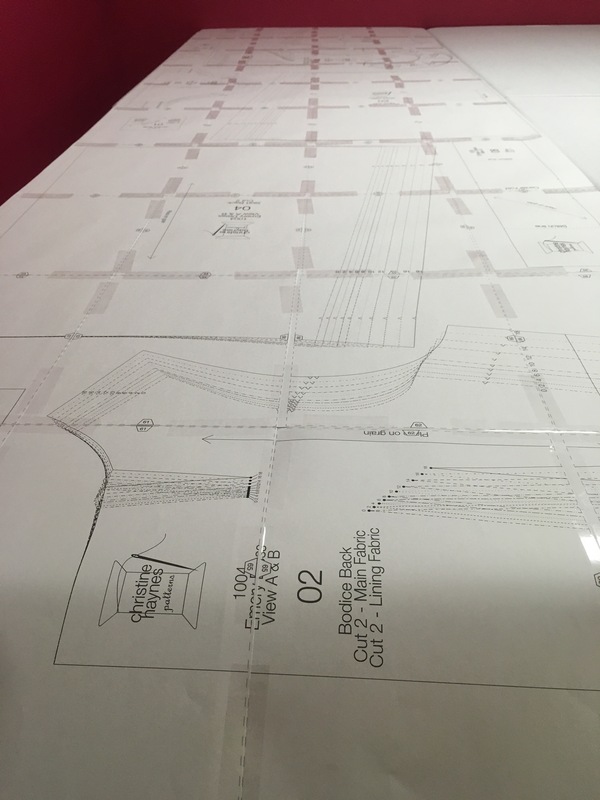 Thanks to a great teacher at Sewingly Yours, ﻿Camille, who measured me, reviewed the bodice pattern pieces and figured out exactly what size I would need to make. With her expertise the fit was perfect the first time with no alterations needed! 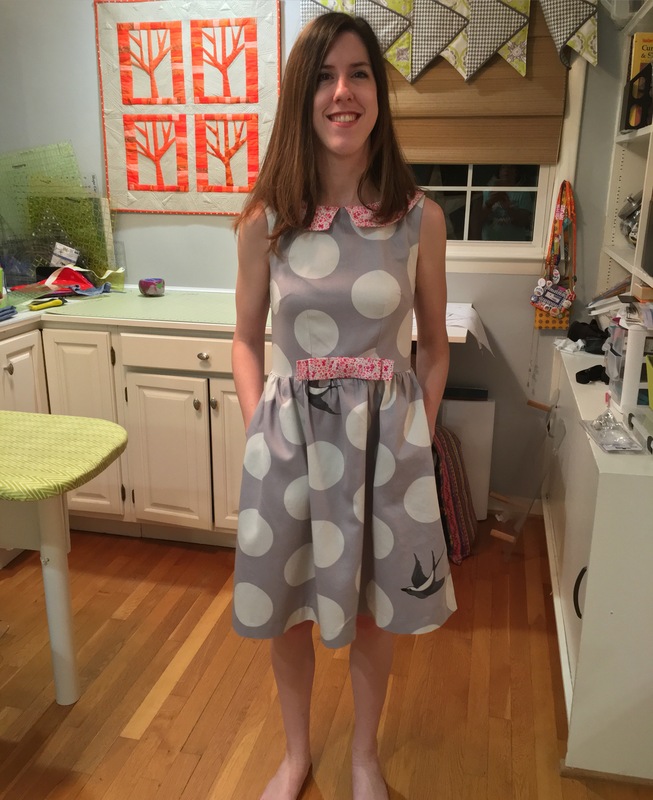 I modified the pattern to be a sleeveless dress rather than short sleeves (mainly because I was on a time crunch and it looked cute without sleeves). I also didn’t line the bodice because I was on a deadline and the fabric was thick enough that it was not necessary. I loved the way it came out! I love the hot pink exposed zipper and the Liberty zipper tab! I will definitely say making garments is not at all similar to making quilts, there are a whole new set of skills and lingo I need to learn! But I will absolutely be making more Emery dresses and garments! I can’t wait to wear it at Quilt Market! Love the fit. It looks great!